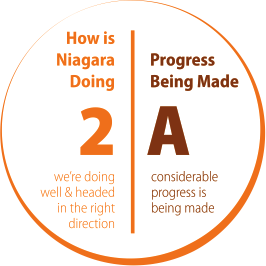 Creating strong education systems and equitable access to lifelong learning opportunities is foundational to Niagara’s growth and prosperity. more adults are participating in education-related activities. Collaborative, systematic approaches are being taken to identify young children at risk of developmental delay, and provide related supports. This aligns Niagara with the provincial goal to promote early learning and development; support parents and caregivers; and provide referrals to specialized services. Five-year secondary school graduation rates in Niagara are above the provincial average, at 90.8% in 2016. This rate is supported by students’ access to alternative learning opportunities, co-op programs and Specialist High Skills Majors. EQAO Math and Grade 10 Ontario Secondary School literacy testing results in Niagara are improving; this aligns with the provincial trend. EQAO testing provides a regular snapshot of Ontario elementary and secondary student achievement in reading, writing and math. Brock University and Niagara College are increasing experiential education and work-integrated learning opportunities for students, in partnership with employers in Niagara and beyond. Access to a broad range of learning opportunities exists for adults, whether they are seeking education attainment, essential workplace skills, inter-generational exchange, or social engagement. There is increasing focus on early intervention to strengthen student self-regulation, with an emphasis on teaching skills in full day Kindergarten. Young students are being encouraged to plan for post-secondary education in their future. Attention is also being paid to making financial support accessible for youth without the necessary personal resources to participate in college or university studies. Initial work is underway to describe adult literacy, in all of its modern forms, in Niagara; this relates to a renewed provincial look at Literacy and Basic Skills programs, and the #Rethink Niagara focus on reducing or removing barriers to people who are not yet participating from being able to build up their own ability to be financially secure. Since 2014, Niagara College international student enrolment has increased from 2,350 to over 3,000 students from more than 80 countries. Brock International student numbers have reduced from 2,350 in 2014, to 1,903 students from 96 countries in 2016. Brock University and Niagara Catholic District School Board are partnering to deliver a new dual credit course, to give thirty Grade 12 students an early introduction to kinesiology for which they will receive academic credit at both the secondary school and university level. Continue to focus on increasing secondary school and post-secondary graduation rates, and student access to experiential and work-integrated learning opportunities. Take a holistic approach to reducing barriers to people achieving post-secondary education, by building awareness of the opportunity at an early age. Address complex factors affecting individual student success, including lack of access to resources such as adequate nutrition, technology and necessities of life. Support development of a comprehensive picture of adult literacy in its modern forms at the neighbourhood level in Niagara, to inform coordinated community planning for increased individual, family and neighbourhood prosperity. Strengthen work underway to promote mental wellness throughout the lifespan in Niagara, as a critical success factor in developing a resilient community and productive workforce. Emphasize access to a range of lifelong learning and education options, to enhance people’s capacity to be adaptable in the modern workplace, and to live meaningful lives at all ages.